Regardless of whether you are a professional or amateur photographer, you certainly oftentimes face a need to retouche your images. Sometimes you need to remove unwanted objects or people from the pictures, and sometimes you have to restore old family photographs. 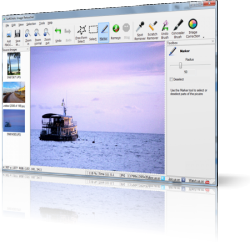 Many users choose to use Adobe Photoshop – a great program that is somehow very expensive and extremely difficult to use. But now you can retouche image and get perfect results in almost no time! 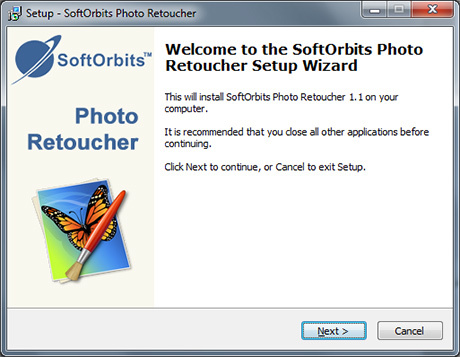 Simply download Photo Retoucher by SoftOrbits and enjoy quick and efficient retouch that’s only a few clicks away! 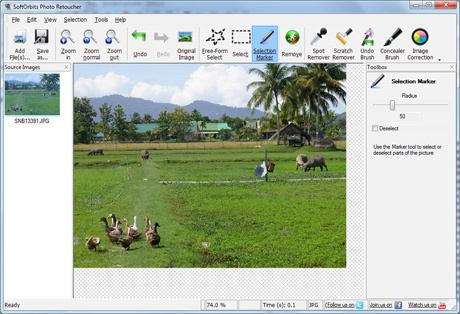 Select the tool to retouche image. Available are Spot remover, Scratch remover, Undo brush, Concealer brush, Image correction and Selection tools. Save the image when you are done editing it using the "Save as..." option. You can save the picture in BMP, GIF, JPEG, PNG, MNG, ICO, TIFF, TGA, PCX, WBMP, JP2, JPC, PGX, RAS, PNM or SKA format.